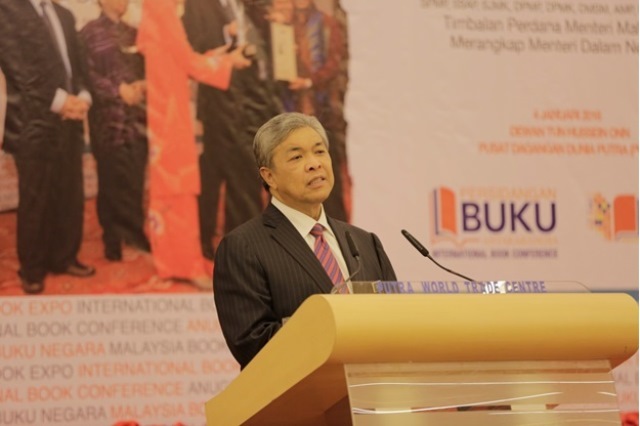 KUALA LUMPUR, 4 Januari 2016 – Deputy Prime Minister YAB Dato’ Seri Diraja Dr. Ahmad Zahid bin Hamidi honoured Universiti Kuala Lumpur (UniKL) by launching a newly set up arm, UniKL Publishing, in a grand event which was held to commemorate and honour the achievements of writers and Malaysia’s book publishing world at large in Majlis Apresiasi Tokoh Sarjana: Penerima Anugerah Buku Negara 2015 held at Dewan Tun Hussein Onn, Putra World Trade Center (PWTC), Kuala Lumpur. UniKL Publishing, the publishing arm of UniKL is established as a platform to encourage writing and publishing among academicians and staff of UniKL, which is seen as a fitting opportunity for them to share their thoughts, ideas and knowledge which will be then translated to either printed medium and digital format or e-book.Among the objectives of UniKL Publishing is to stimulate the interest in writing and writing based on issues and topic of interest determined by the members and faculties, organise trainings and workshops on writing, publication and publishing as well as to encourage knowledge creation and provide support for research projects. Prof. Dr. Corrado G.M. 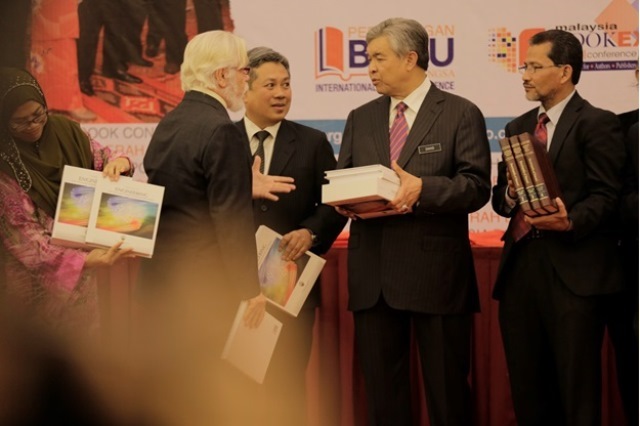 Letta of UniKL Business School explains about his book, “Engineering East Asia-Latin America Economic Relations” to YAB Dato’ Seri Diraja Dr. Ahmad Zahid bin Hamidi. Looking upon is Universiti Kuala Lumpur President and CEO Prof. Dato’ Dr. Mazliham Mohd Su’ud and Chairman of Yayasan Pembangunan Buku Negara, Hasan Hamzah. The event was successful in its objective to provide a platform for participants to share and exchange ideas on best practices for continuous improvements at the work place. The exposition also inculcates the culture of knowledge-sharing and encourages life-long learning. With this recent recognition as well as the renewal of UniKL MESTECH’s 5S accreditation, the university pledges towards achieving simplicity at work, waste reduction and elimination of non-value adding activities, while improving quality, efficiency, safety as well as creating a healthy working climate. 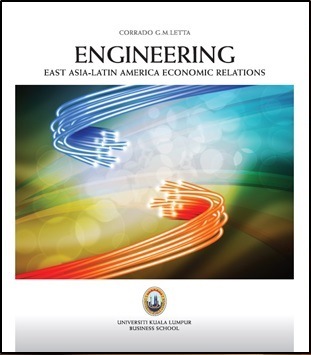 The event also saw the launching of the first book published by UniKL Publishing, an academic book titled “Engineering East Asia-Latin America Economic Relations” authored by Prof. Dr. Corrado G.M. Letta, a Senior Fellow in Universiti Kuala Lumpur Business School (UniKL Business School). The book discusses the convoluted relationship as well as the economic potentials of both these continents who have recorded the highest economic growth, ASEAN and Latin America, and how this potential can be further explored and developed through strategic partnerships transcending political boundaries. Prof. Dr. Corrado G.M. Letta is a distinguished academician, well-known in the sphere of International Relations especially in East Asia-Latin America relations. He has served in over 13 continents including America, South America, Middle East, East Asia, Africa and also South East Asia. He has written almost 30 books and journals on international relations as well as having served Malaysia’s Ministry of Foreign Affairs as a consultant. His book, loaded with in-depth data, knowledge and suggestions serves as a guide to improve the relations between these two continents and taking it to greater heights. This book is targeted to policy makers, business leaders and fellow academicians exploring the topic of East Asia and Latin America relations.